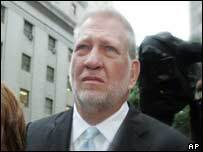 Former Worldcom boss Bernard Ebbers wept openly as he was sentenced to 25 years in jail for his part in the scandal that brought down the firm. Mr Ebbers was found guilty of fraud and conspiracy in March, following revelations of an $11bn (£6.2bn) accounting fraud at Worldcom in 2002. The 63-year-old was also guilty of seven counts of filing false documents. Mr Ebbers will begin serving his sentence at a federal prison in Yazoo City, Mississippi, close to his home. The sentence was handed down by federal judge Barbara Jones, who earlier this week rejected his request for a new trial. The sentence was the toughest yet in a string of corporate scandals in the US. Mr Ebbers did not address the court. Instead, he wiped his eyes with a white tissue. Meanwhile, Kristie Ebbers, his wife, cried quietly. The jail term effectively satisfies pleas from prosecutors for a life sentence to be imposed on Mr Ebbers. Defence lawyer Reid Weingarten had called for a more lenient sentence, given Mr Ebbers' heart condition and his involvement in charitable works. However, Judge Barbara Jones said she did not believe his heart condition was sufficiently serious to warrant a reduced sentence. She also rejected his lawyers' contention that the government overstated the losses that investors suffered in the fraud. And she rejected their contention that Mr Ebbers was not a mastermind of the accounting wrongdoing. Mr Ebbers "was clearly a leader of criminal activity in this case," the judge said. "A sentence of anything less would not reflect the seriousness of the crime." Worldcom's collapse was the biggest bankruptcy in US corporate history. Some 20,000 workers lost their jobs, while shareholders lost about $180bn, when the company filed for bankruptcy protection. A former Worldcom salesman, Henry J Bruin Jr, told the hearing in Manhattan that the company's collapse had caused him "untold human carnage" and that he had suffered "sheer hell". Mr Ebbers is the first of six former Worldcom executives and accountants facing sentencing this summer. The remaining five have already pleaded guilty and agreed to co-operate in the case against their former boss. On Monday, a judge backed a multi-million dollar settlement under which Mr Ebbers must surrender most of his personal assets, including $5m in cash, to resolve a shareholder lawsuit. The settlement leaves Mr Ebbers' wife with about $50,000 of her husband's fortune, and a modest home in Jackson, Mississippi. Born in Edmonton, Canada on 27 August, 1941, Bernard Ebbers worked as a basketball coach, teacher and warehouse manager before running a chain of motels from which he launched his stellar telecoms career. He snapped up rivals and took advantage of the end of AT&T's monopoly which enabled him to offer phone deals at bargain prices. With his fortune rapidly growing, in 1995 he paid £1.2bn for WilTel Network Services and changed its name to WorldCom. By mid-1999 WorldCom shares reached an all-time high and Mr Ebbers became the darling of Wall Street. "I believe God has a plan for people's lives, and I believe he had a plan for me," Mr Ebbers once said. President Bill Clinton once called him "the symbol of 21st Century America" and said Mr Ebbers was "the embodiment of what I want for the future". But in 2001, his attempts to buy larger rival Sprint were thwarted by regulators and worries about WorldCom's mounting debt began to emerge. Mr Ebbers quit the firm in 2002 after admitting borrowing money from WorldCom to cover losses he incurred in buying its shares. In the same year WorldCom went bankrupt. It emerged from bankruptcy in 2004, renaming itself MCI.